Of the making of books about the Pre-Raphaelites, it appears, there is no end. Like the Bloomsberries, most of the PRB are more interesting to read about than the study of their work would suggest: a few towering talents stalk the mountaintops, while many lesser ones lurk in valleys and foothills. George Boyce was one of those lesser talents – a watercolourist of some small fame among his colleagues (although he was 52 before he was elected to full membership of the Old Water-Colour Society). His friend Henry Tanworth Wells had more worldly recognition, if not the esteem of the avant-garde: as a portraitist he painted the great, the good, the socially eminent or the just plain rich. The two men were also connected through a third painter, Boyce’s sister Joanna. She too had some contemporary success, exhibiting a few pictures at the Royal Academy. But much of her work has remained in private collections, and, apart from a sketchbook in the British Museum, is not available to the general public. All the more welcome, therefore, is Sue Bradbury’s retelling of the trio’s story. 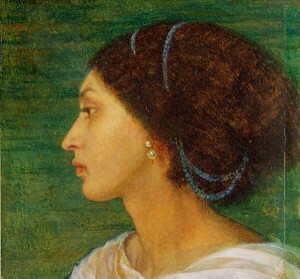 Boyce’s diaries, heavily abridged and apparently redacted, have long been published, giving his thoughts on painting, and, more interestingly, his many artistic friendships (until Rossetti’s late decline, they were close, sharing views on art and women – and possibly even sharing the women). These are now supplemented by the hundreds of letters the three exchanged. Boyce and Wells met in 1849, at Betws-y-Coed, in Wales, where students clustered around the landscape painter David Cox. In 1853 Boyce’s father, usually described as a silversmith, but in reality a successful pawnbroker, died, and his grown children came into handsome inheritances, which ensured that Boyce could travel and socialize without any need to earn a living by his art. In 1855 Wells proposed to his friend’s sister. Joanna, however, feared that marriage and work could not coexist for women, and that her art would be lost in wife- and motherhood. She turned Wells down, although the three-way correspondence continued. In 1858 the couple did, finally, marry, but had only a few short years before Joanna’s death in childbirth. The light their correspondence shines on the more famous painters of the period is delightful – Millais, wrote Boyce, was ‘Somewhat egotistical and little real’ – even if the passing of time has altered more than somewhat – Ingres, says Joanna firmly, was ‘An execrable draftsman’, Delacroix ‘full of the most daring and glaring imperfections’, and neither could compare to Paul Delaroche or Thomas Couture. But the core of the story elaborates what so many Victorian novels only hint at: the struggle between unmarried daughters and their mothers. In her early letters Joanna felt ‘it is my plain duty to give up all hope of improvement in painting, rather than in any way neglect Mamma’. Before her husband’s death Mrs Boyce had approved of Wells’ courtship of their daughter, but afterwards she performed a radical volte-face. First she rejected him for having insufficient income. After he had satisfactorily proved his solvency she fell back on rumours of unspecified immoral conduct, then objected to his lowly family origins (although, as Bradbury fails to point out, Wells’ family of yeomen farmers was more than a match for that of a pawnbroker, however wealthy). It took Joanna four years to break out from under her mother’s sway as accusations were hurled back and forth, letters were copied and handed around as ‘proof’ of one side or the other, family alliances were brokered and traduced. This section of the book is gripping, and Bradbury allows the characters one by one to come to the fore. For, despite the large number of fine reproductions included in the book, it is still not possible to summon much enthusiasm for the work of these minor painters; the diaries and letters they left behind, however, are social history at its most fascinating. This entry was posted in Journalism and tagged 19th century, art, reviews by inspectorbucket. Bookmark the permalink.